I’ve wanted to be a locavore ever since I read Barbara Kingsolver’s most excellent memoir, Animal, Vegetable, Miracle. I live on a one third acre lot, on sandy Cape Cod, in the oh so chilly Northeast, and it’s a challenging proposition. But this past weekend it actually felt possible. For the past month, every Saturday morning I head down to the Orleans Farmers Market to buy our produce. It’s been fun catching up with my farmer friends, but the pickings have been slim, until this weekend. Finally, things are starting to grow on Cape Cod and we filled our bag with salad greens, winter kale, radishes, scallions, leeks, and a dozen quail eggs. The quail eggs taste just like regular eggs, but they are so tiny and cute. You simply boil them for five minutes and then let them rest in a cold water bath for ten minutes. They’re fabulous in a salad. We also recently joined a raw milk co-op from Paskamansett Farms in Dartmouth. There are 12 members in the coop who take turns driving 145 miles round trip to pick up the weekly milk supply for everyone. A two and a half hour drive once every 12 weeks does not seem like too much work for the pleasure of drinking raw milk. It comes in glass bottles like I remember from my early childhood. Being in a milk coop is a bit different than running to the store when you run out of milk, because you have a standard order each week. That means if you don’t use it all, more is still coming. So this week, in addition to an abundance of bluefish, we have an abundance of milk. I’m discovering the life of a locavore involves a certain amount of repetition. Rather than cooking what you have a craving for, you have to dream up recipes that use what you have on hand. So far I haven’t tired of the challenge, or the flavors, but all that milk left me flummoxed. 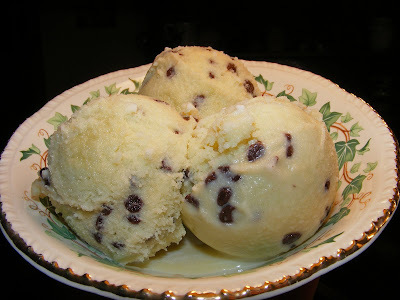 Thankfully Karen at Karen Cooks, recently posted a recipe for Fresh Mint Chocolate Chip Ice Cream. Her recipe called for 1 1/2 cups each of whole milk and half and half, but we decided the cream that rose to the top of our milk might be creamy enough substitute all milk for the half and half. Besides, we were psyched to use up three cups of milk. 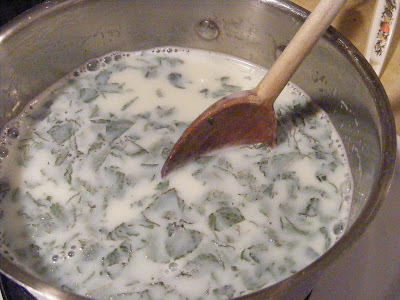 First you steep fresh mint leaves in the milk for a half an hour. We didn't add food coloring for a prettier color and our raw milk version wasn’t as creamy as ice cream, but it was plenty rich and the fresh mint flavor is indescribable. For the recipe, visit Karen’s Blog and while you’re there, check our her gorgeous gardens! I wish I good get quail eggs here, or fresh ones anyway. The ice cream looks delicious--love the milk in glass bottles. We have a dairy coming to the North Shore here--finally! They are starting to sell butter first this month and milk later on. I will be so happy to have local milk and butter. I've been hearing a lot about locavores these days, so thank you for giving me an inside scoop. I love quail eggs. Somehow they taste so much more delicate and clean to me than regular eggs. I don't like the milk I get in grocery stores. I wonder how much better local milk tastes? My favorite flavor! Have fun being a locavore, it's worth it! Lovely post! Eating locally is so very rewarding... and the flavor of such fresh foods! Incredible. We've found we can live about 80% local during the summer months in Wisconsin. And we can stretch that out into the winter if we put up quite a bit of food. As you can imagine, local milk, cheese, and butter around here is easy. But, produce gets to be a challenge in the winter months. I love that book! The fresh cream rising to the top sounds so yummy! 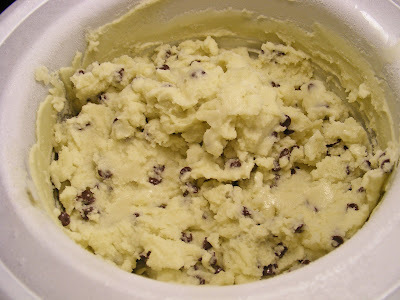 Great idea to make ice cream with it! I bet it was divine! I have whipped out my ice cream maker and started making ice cream and sorbets too. It is so good to have it homemade isn't it? It must be getting warmer up there by now? That is the prettiest plate of salad! And I love the sound of your icecream. Are you going to try making cheese? I am thinking....perhaps I should really get an icecream maker! We just don't eat it that much. But wow....the recipes one can make. This looks good. I love being a locavore and I too head to my local markets ALLLLLLL the time...well...except I am out in the boonies near a city and as I work in the city...I must admit...I sometimes get produce there. Not exotic enough in my little place for all the things I cook. But I like your blog...very nice!